After my visit to the produce auction on Friday, I came home and started cleaning out the fridge. As I’ve stated, I hate wasting ANYTHING, and I had a few things in the fridge that were at the “cook me or toss me” stage. Of course I chose to cook! I had eggplant, yellow squash, leeks, mushrooms, broccoli, peppers, yellow cherry tomatoes, and half an onion that all needed my immediate attention. 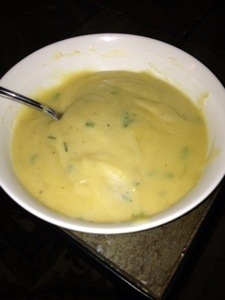 So the leeks got paired with potatoes for delicious leek and potato soup. 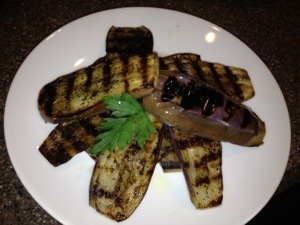 Some of the eggplant was planked and grilled with Italian herbs for a quick side dish, or a panini sandwich later. A few of the yellow squash were charred in a cast iron skillet and tossed with roasted almonds in a turmeric and honey glaze before being finished off with fresh parsley. The rest of the eggplant and squash were roasted (along with some carrots) in the oven and then combined with those cherry tomatoes, broccoli, and some fresh green beans into a big pot of vegetable soup. The mushrooms, peppers, and onion all got sauteed in olive oil and garlic until caramelized and soft. It will end up being an amazing condiment/topping for hamburgers or steak in the next few days. The eggplant planks couldn’t be easier. Slice in thirds, salt to draw out the water. Pat them dry, and then brush with olive oil. Sprinkle on Italian seasoning and pop into a grill pan. Turn them over once you get those awesome marks, and then finish with a drizzle of garlic infused oil at the end. 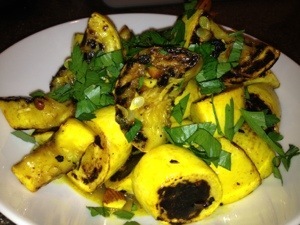 I modified the squash from Aarti Sequeira’s recipe on the Food Network. I didn’t have hazelnuts, and I had more parsley than cilantro. PLUS butter isn’t Paleo, so I used coconut oil. It turned out delicious and beautiful! 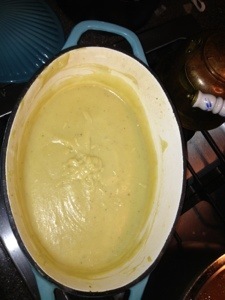 My leek and potato soup recipe is from my man Alton Brown. Again, I skipped the dairy since it isn’t Paleo, and you know what? I didn’t miss it at all. I added thyme to my potatoes and leeks, and when I fired up my immersion blender, the soup ended up perfectly creamy and smooth. I didn’t miss the cream or the buttermilk at all. I built the base of my veggie soup by sweating onion, garlic, and celery until soft, and then adding those yellow cherry tomatoes and salt until the tomatoes “popped”. I then used the immersion blender again (reason number ONE THOUSAND why my husband is the best ever… I LOVE my immersion blender) and made the base smooth. I added a quart of organic, free range chicken broth, a can of diced tomatoes, a bay leaf, thyme, and some salt. I had cubed and roasted some yellow squash, eggplant, and carrots in a 400 degree oven until they were a little tender and browned a bit. I added them to the soup broth along with the broccoli and some fresh green beans. Simmered on the stove until the veggies were all soft… the soup is really flavorful and sweet. It’s like a little bit of leftover summer in a bowl! So, now my fridge is a little cleaner, I didn’t have to throw out anything, and I’ve got food prepared that I can heat up quickly and eat while on the run. Plus, my wallet is happy! No waste, and no need to pay more than I have to by eating out. My dad is going to be so proud when I tell him. Of course he’ll want to come over for dinner and that’s fine too. Since I have another rehearsal tonight, I’ve decided to adjust my meal schedule. I let my high protein breakfast (eggs and bacon) tide me over as long as possible. I then decided to go to my favorite place and get a late lunch/early dinner so I don’t fall out (or off) stage. 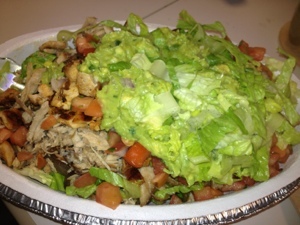 So, Chipotle to the rescue! I got myself a salad (no rice or beans) with carnitas and chicken, lots of mild salsa (which is really pico de gallo) and guacamole. Lots of veggies, protein, and healthy fat. Very satisfying and the time adjustment means I SHOULD be able to get through tonight’s dress rehearsal without incident. Of course if you hear sirens coming from our theater district, all bets are off! It’s theater “hell week” with rehearsals every night as we prepare to open. Rehearsals = stress = insomnia = 4 hours sleep = exhausted me = caffeine = not exactly Paleo today. This morning I had enough time to get a real, high protein breakfast. I had two eggs – scrambled, about 5 ounces of steak, and sliced tomatoes. It is now four and a half hours later and I am still full and satisfied. My energy levels are good, my head is clear (no brain fog) and I am not jonesing for lunch or a candy snack. If you are doing the challenge, or just trying to eat more Paleo, start with a high-protein breakfast. It really will be your most important meal of the day. More later! OY! No caffeine is making my head pound. Other than that, I’m doing ok. Need to plan a bit more, since theater stuff is keeping me out of the house and away from the kitchen. I REALLY need to find time to cook a few things, so that I have leftovers. My rehearsal schedule is killer though, so I think tomorrow may end up being a Chipotle kind of day (no beans, no rice, no cheese!) Or maybe a big burger from Red Robin. For now though, I’m going to hit the hay. Part of this challenge is getting enough sleep, and that’s an area I sorely lack. TOMORROW the challenge is ON! Thirty days. Thirty days to change your life. Thirty days to eat clean and see how good you can feel. The “rules” are easy…. and there are PLENTY of resources out there to help. Eat meat (preferably grass-fed or pasture raised). Eat veggies and fruits (remember your Dirty Dozen and Clean Fifteen!) and eat nuts and seeds in moderation. That’s it. Think and eat like a caveman. I’ll post what I eat, and you can do the same. I did this challenge in January and felt amazing. 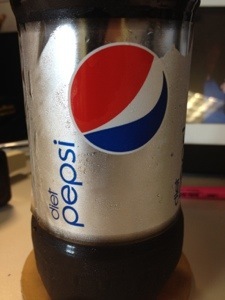 But then of course, came summertime, and ice cream and cheese… and cold Diet Coke. I wasn’t horrible, but I wasn’t strict either. But I will be tomorrow! Here are some amazing resources for you if you’re new to Paleo eating. These folks have great information, and it’s all presented in a way that is easy to read, easy to understand, and easy to follow. Read up, eat up and enjoy! I can’t wait to hear about all of YOUR success!